In the previous episode of CSI Las Vegas entitled “Grissom’s Divine Comedy”, the Apple iPhone has a brief TV time wherein Catherine shows off the picture sending capabilities of the iPhone. 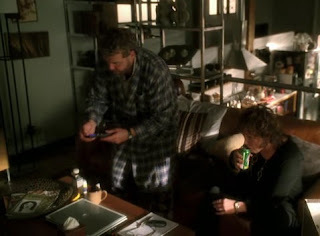 Check out the pic wherein she takes a picture of the crime scene and sends it to Grissom’s email account since he’s at home, sick. Though the producers try to be subtle about this product endorsement (they didn’t show the Apple Logo at the back of the phone since the iPhone is conveniently tucked in a protective glove-like case. But of course, there’s no mistaking that 3 inch screen and the photo options. This particular show of the possible uses of the iPhone may wow some not so tech savvy person but of course, not me. If Catherine has a 3G enabled phone say, Nokia N95, an HTC smartphone, etc, she would have video-called Grissom and take him on a tour of the crime scene REAL time. Also, I doubt that the picture taken my Catherine is THAT great in real life since the iPhone doesn’t have autofocus and Grissom will probably miss all the little details that Grissom always “miraculously” sees whenever he’s at a crime scene. I also thought that Apple has taken over the sponsorship of CSI Las Vegas because when the camera pans to Grissom, he opens up his laptop to check Catherine’s photos on his email. Because of my blurry eyes, I initially thought that Grissom was sporting a Mac, but no, it’s actually a Dell Inspiron E1705. Check out the screenshot of the Dell E1705 in another scene below. I wonder what other features of the iPhone that the producers would think of using next in order to help solve a crime? Would we see Catherine browsing the Internet on the Safari Browser on the iPhone or using iPhone’s cool interface in zooming in and out of mug shots? Probably depends on how much Apple will be willing to fork over. Maybe there will be a cameo of the Macbook Air in a manila envelope!